The Company | Kulkarni Laboratory & Quality Management Services. KULKARNI LABORATORY AND QUALITY MANAGEMENT SERVICES, PUNE. 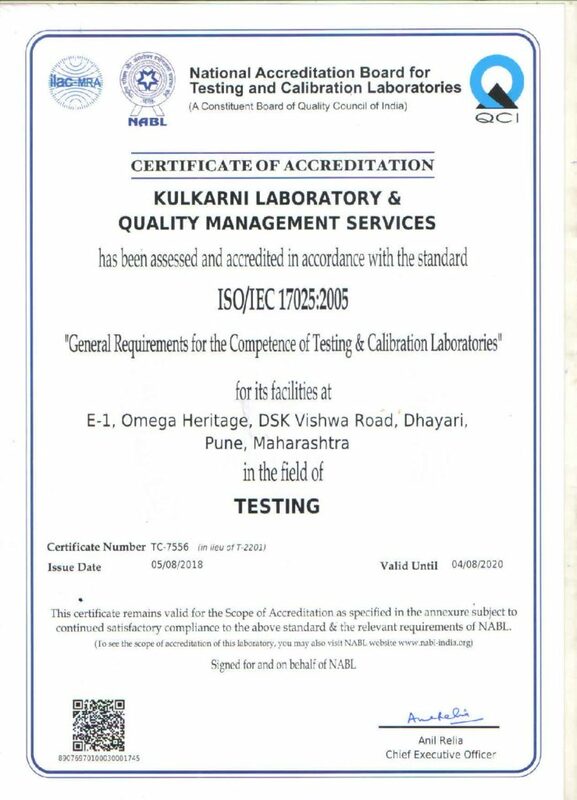 Kulkarni Laboratory and Quality Management Services, is one of leading NABL accredited testing laboratory set up in 2005. Shri. Prakash Kulkarni, the owner of the Laboratory, has about 50years of Quality control experience in Defence organization and various industries. The Laboratory is working in Quality Control services since last 12 years and committed to providing accurate & reliable results to customers. The Laboratory has NABL accreditation for Paint-Surface coatings, adhesives & Mechanical testing of Rubber, Plastic & Textile. The Laboratory provides various Quality Control Services i.e., testing of the range of material types as per IS, ASTM, ISO, JSS, IND/ME standards. The laboratory develops new products with the help of the research and development process.